Bianca and Garrett tie the knot! Home / All / Bianca and Garrett tie the knot! 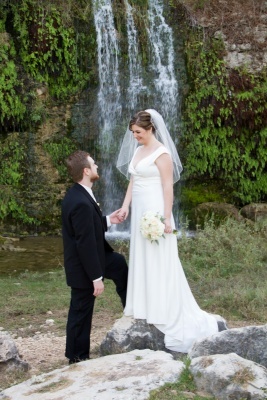 Bianca and Garrett celebrated their marriage at Canyon Springs Golf Club on November 6th, 2010. Bianca chose a deep chocolate and sage green for the wedding and reception. She had a lovely a line wedding dress that showed off her beautiful neckline. The wedding was outdoors and the weather was perfect, the sunset highlighted the couple through their vows. After the ceremony was over the wedding party jumped on golf carts and headed down to the waterfall to take some special pictures. The reception that followed was cozy. Warmed by a fire in the hearth; the guests enjoyed the meal and the cake and peach cobbler finished off the meal perfectly. The groom had a very special record player cake that had an Pink Floyd “Dark side of the Moon” album on it. Very cool! Family and friends got to mingle late into the evening enjoying their time together. It was a cold night but the warmth and love that surrounded this couple made it perfect. I am happy to wish Bianca and Garrett a very happy marriage! To see more images from this and other weddings visit www.facebook.com/StraughanPhoto.